Well I'll be! 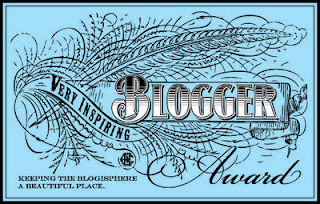 I'll have to admit that until my last post I wasn't even sure if anyone was actually reading my blog, so now I'm even more flattered to receive the Very Inspiring Blogger Award nomination from Marijke. She commented on one of my first posts, so I know she's been following along for a while. Display the award and link back to the person who nominated you. 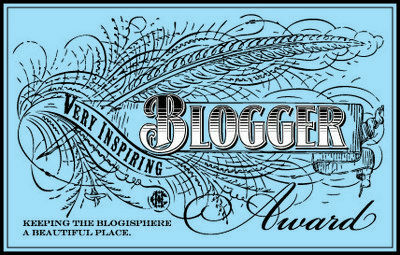 Nominate 15 bloggers for the award. I guess I'm a little confused about the last one. Does that mean notify the 15 bloggers who you've nominated? I'll go with that. I'm a cocktail geek (some might say snob). My favourite cocktail is the old fashioned, but the old fashioned old fashioned, not the horrible thing that developed in the 1950's. I'm talking about the one that appeared in 1862 in the first bartender's guide ever, written by Jerry Thomas: sugar, bitters, and whiskey, over ice, with a twist of lemon. No muddled fruit. No soda water. Just sugar, bitters, and whiskey. Yum. I've hiked all 2,100 miles of the Appalachian Trail, all 2,600 miles of the Pacific Crest Trail, and over 2,000 miles of the Continental Divide Trail. That's a total of a year and a half of living outdoors every day, sleeping either in a tent or under the stars. I wore a kilt for three years, eschewing trousers. Although I reside in Boston, MA, I've lived in England (W. Yorkshire) and France (Alpes-Maritimes and Ariège) as well as spending two months traveling around Ireland. My wedding was steampunk-themed (though if you read this blog you probably already know that). I've been brewing beer for nine years, and although I mostly concentrate on English session styles, my favourite, and the one I've brewed the most, is a black pepper saison. Drunktailor - With a blog change it's hard to keep up with the Drunk Tailor! But I like his goal of producing clothing that the masses would have worn, not the elite. Passion for the Past - Ken participates in living history in Michigan, concentrating on the Civil War era. I like that he and most of his family portrays civilians. There are plenty of military reenactors. For the Love of History - Jim not only makes reproduction clothing based on the Gold Rush era of California, but also recreates many of the personal objects of the people of that time. I'm in awe of his skills. Williams Clothiers - Although the site is a storefront for James Williams' period tailoring service, he also makes posts about drafting patterns and other costuming thoughts, and the gallery is drool-worthy. I've never seen so many photos of pad stitching in one place. Male Pattern Boldness - What can I say about Peter that hasn't been said already? A sewing ambassador. The Japanese Pattern Challenge - A blog started to publicly learn to sew, Mainelydad has long since done so, and has raised the bar to try new and exciting things. There are also one or two Victorian-style projects on his site. TaylorTailor - Taylor wanted a pair of jeans, so he learned to sew, then he learned to draft his own patterns, and then he opened a shop selling hard-to-source denim and jeans-related hardware. It's great to see someone who isn't afraid to jump in and figure something out for himself. See Jason Sew - I only wish we could see Jason sew more often - he doesn't update often, but when he does it's worth it. Rory Duffy Handcraft Tailor - It's no longer amateur hour, folks. Rory is a Savile Row-trained tailor, and is gracious enough to let us look at photos of his work and process. Davide Taub - Another professional, Davide works in Savile Row. His cutting style is non-traditional to say the least, but it pays homage to the past, and you can see the early 19th century in many of his pieces. I also love the secret embellishments he puts under the lapels of many of his jackets and coats. Diary of a Mantua Maker - All of ColeV's clothing is amazing, but look at that steampunk outfit! Just look at it! At the Sign of the Golden Scissors - Hallie Larkin knows what she's talking about when it comes to 18th century clothing. It's a little before my preferred time, but I keep going back to learn more. Before the Automobile - I'm just in awe here. Augustintytär doesn't just make beautiful clothing and then take a couple pictures of it - you get to scroll through pages and pages of photos with the Finnish countryside as the backdrop. The Fashionable Past - With all the great sites on costuming for women in the 19th century out there, this is one I keep coming back to. This recent robe a l'anglaise series is one of my favourites. 19th Century Costuming - or HistoricalSewing.com - I'm not sure which title Jennifer Rosbrugh likes to use. Whichever one it is, this blog is packed full of tips and information, as well as photos of her clothing. That took a long time to write up! Think of all the tailoring I could be getting done! Hi Andrew - please know that you are dually noted :-) I also nominated you, and was on my way to email you when I say the award up already. You deserve it! I am a big fan of your work. Congratulations! So nice how the pictures on your posts can be enlarged to show detail. The buttonhole technique in your last post was excellently illustrated. Many thanks for sharing your work, you are indeed inspiring.